My wonderful future sister-in-law (if my BIL ever gets off his duff) is running a project called Blankies for Boston. They are collecting 1000 comfort blankets for victims, victims’ families, and first responders of the Boston Marathon bombing. The four women organizing this project met knitting and crocheting scarves for the children of Sandy Hook Elementary School, which collected over 3500 scarves! In just two days, Blankies for Boston, had participants from the UK to California. Know how to knit? Head on over to the Facebook page and check out the specs and get knitting? Know someone that knits (um MOM? Can you hear me?) then send them this link. There are a ton of people from other parts of the country helping out, but now they need help getting the word out locally. Get the word out my bloggy friends. Get the word OUT! Also, please message them if you are directly connected to a victim or first responder, so that they can get them a blanket. I am a 70 yr old gr grandma and I DO NOT belong to Facebook. Can I still participate with a blankie even though I am probably one of the very few who do not belong to Facebook. Of course! I’ll send you an email so you can get more info. Thank you! Thank you so much. Was able to open docs.and got the information regarding size, shipping and also patterns. I am not computer savvy so I feel real smug I was able to do something. haha. Have my yarn and am ready to go. Thank you again for your help and for your loving thoughts along with your future sil for organizing this project for Boston. 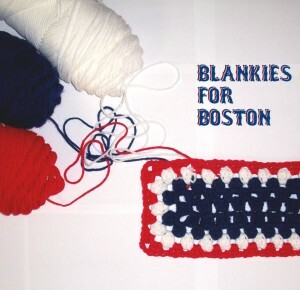 I would love to knit a blankie for Boston!! Where can I send it when it’s done? I am from Mississauga Ontario Canada! !